JDK 7 with JSR 334 (Small language enhancements). I think that the the strings in switch, and multi-cache and more precise rethrow is quite useful. When you ssh to a remote machine and want to execute a graphic bound applications such as JFrame etc, use ssh with -X argument. -X is for forwarding. Make sure to include symbolic links to .configure to work properly. 1. I have two machines. A hardware rich machine A (172.19.0.32) and some other machine B (172.19.0.44). 2. I downloaded and installed VMWare 2 in machine A. This version is free and you will get an access key free too. Follow the simple instructions to install VMWare 2. 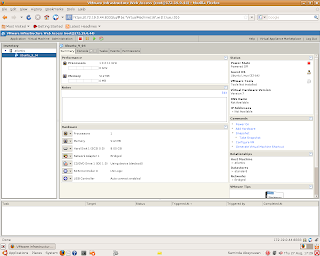 VMWare 2 has a very powerful web console. Default http port is 8222 and https port is 8333. 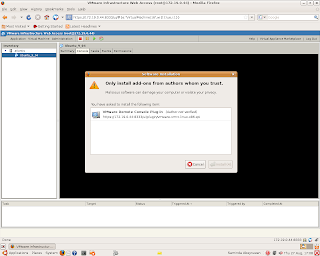 To install VMWare 2 in Ubuntu, follow these instructions. 3. 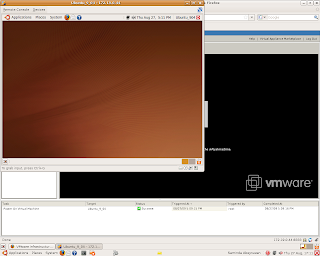 Now I am going to create an VMWare image to install Ubuntu 9.04. Ubuntu is my all time favourite Linux distribution. 4. From machine A, open up a Mozilla browser and type http://172.19.0.32:8222. Login using "root" and the password. Create the VMImage for Ubuntu 9.04. If you are using the "console" tab for the very first time, browse will ask to download VMWare Remote Console Puglin. Download and restart the browser. 5. Create many number of VMImages. Use different distributions. If you want you can use Windows too. Logout after this. This is the place where we can introduce the notion of a virtual cloud. Each VMImage can be treated as a node in a cloud. There is one limitation though. This cloud can grow up until it runs out of VMImages. 6. I have created my virtual cloud in the previous step. How can I access it from out side. Lets go to machine B. In my example machine B is in the same network. Access the VMWare 2 using http://172.19.0.44:8222. Login as "root" and password. I need to find out administration permissions documents to create users to access VMImages but "root". 7. In this example, there is only one VMImage. Select it and power it up. You can turn on many VMImages. This way you can create your own private virtual cloud. Amazon EC2 allows users to create custom AMIs. Unless one does not have an agreement with them, one can not build AKIs and ARIs. If I do the prior in an Amazon EC2 node, I would definitely be able to run a distribution with my kernel, without worrying about underlying necessaties. This process might be possible to try in any cloud service providers. One would ask, why would you want to do this after all. Well I am a grad student and this is fun!.